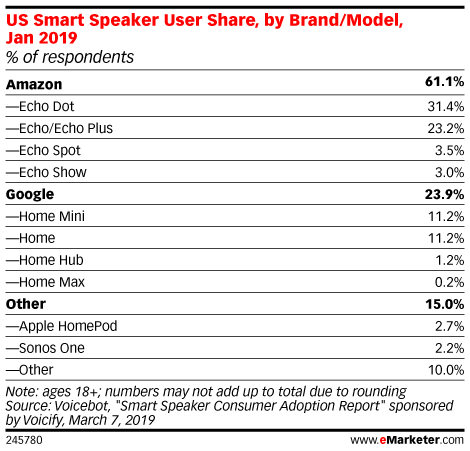 Data is from the March 2019 Voicebot "Smart Speaker Consumer Adoption Report" sponsored by Voicify. 1,038 US internet users ages 18+ were surveyed online in January 2019. Overall device ownership figures were adjusted downward to compensate for the base of adult internet users, which represent 89% of the total population. Other findings are relative to smart speaker owners and did not require adjustment. The survey sample was representative of US Census demographic averages. Voicebot is a media property focusing on the voice-enabled web. Voicify is a voice experience software platform.